Thomas Edison said, “Genius is one percent inspiration and ninety-nine percent perspiration.” (Without claiming genius) I think this applies to photography as well: Many successful images are more the product of being in the right place at the right time than divine inspiration. Of course anyone can stumble upon a lucky convergence of location and conditions and come home with a great photo, but the “genius” behind creating great photos consistently is preparation and sacrifice–a.k.a., perspiration. The moonrise on the final sunrise shoot of last week’s Yosemite workshop spurred these thoughts about inspiration and effort. We were all in more or less the same place, photographing the same thing. And while everyone probably captured very similar images (in this case of a crescent moon squeezing between El Capitan and Half Dome), the true magic was simply being there. But why were we the only ones there to witness this special moment that probably won’t repeat for decades? Determining the moon’s altitude and azimuth from any location on Earth is as easy as visiting one of many websites, or using one of many astronomical software applications such as The Photographer’s Ephemeris or (my preference) the Focalware iPhone app. Armed with this data, aligning the moon’s rise with any landmark isn’t rocket science. Based on my calculations and plotting, I scheduled my “Yosemite Dogwood and Rising Crescent” workshop to coincide with a sunrise crescent moon. The dogwood bloom isn’t as reliable, but I know interesting weather is still possible in Yosemite in late April and early May. What we ended up with was mostly clear skies (great for tourists, but definitely not for photographers) and a very late dogwood bloom in Yosemite (probably two weeks behind “schedule”), forcing me to shift the daytime emphasis of my spring workshop to rainbows. I’m happy to report Bridalveil and Yosemite Falls delivered more photogenic rainbows than I can count, from a number of different locations. As spectacular as they were, overshadowing the rainbows was the moonrise on our penultimate morning. I promised the group that departing at 4:50a.m. would get us to Tunnel View in time to photograph a 7% crescent moon rise above Yosemite Valley, between Sentinel Dome and Cathedral Rocks, in the pre-dawn twilight. (I knew this because I’ve been calculating moonrise and moonsets in Yosemite and elsewhere for many years, and have photographed more of these from Tunnel View than any other location.) That moonrise came off exactly as advertised–so far so good. But the Tunnel View success, as beautiful as our images were, was merely a warm-up that gave everyone an opportunity to hone their silhouette exposure and composition skills in advance of the rare moonrise opportunity I’d planned for the next morning. 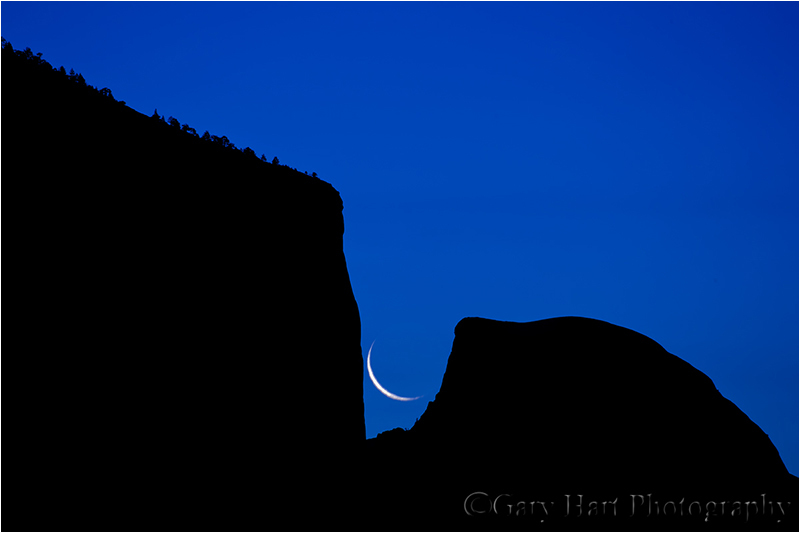 When scheduling this workshop I’d determined that about 45 minutes before sunrise on May 1 of this year (2011), a delicate 3% crescent moon would slip into the narrow gap between El Capitan and Half Dome for anyone watching from Half Dome View on Big Oak Flat Road. Lunar tables assume a flat horizon, so unless I’m at the ocean, the primary uncertainty is when the moon will appear above (or disappear below) the not-flat horizon. Once I’ve photographed a moonrise (or set) from a location, I simply check the precise time of its appearance (or disappearance) against the altitude/azimuth data for that day to get the exact angle of the horizon from there. Until I have this horizon information, I only have the moon’s direction and elevation above the unobstructed horizon and can only make an educated guess as to the time and location of its appearance. The other big wildcard in moon and moonlight photography is the weather, but a last minute check with the National Weather Service confirmed that all systems were go there. Nevertheless, despite all my obsessive plotting, checking, and double-checking, having never photographed a moonrise from this location, and the fact that an error would affect not just me but my entire group, I couldn’t help feel more than a little anxious. Sunday morning we departed dark and early (4:45 a.m.), full of anticipation. We arrived at Half Dome View a little after 5:00, early enough to enable everyone to set up their tripods, frame their compositions, and set their exposures. Then we waited, all eyes locked on the gap separating El Capitan and Half Dome. Well, almost all eyes–mine made frequent detours to my watch and the Focalware iPhone app responsible for my bold (rash?) prediction. (What was I thinking, promising a moonrise into a paper-thin space in a five minute span from a spot where I’d never photographed a moonrise?) My watch crawled toward the 5:15-5:20 window: 5:15 (Is the notch shrinking? ); 5:16 (It’s shrinking–I swear I just saw Half Dome inch closer to El Capitan); 5:17 (I entered the coordinates wrong, I know I did–what if it comes up behind us?). Surely this wasn’t the kind of perspiration Edison was thinking about. Before the shared euphoria abated, I suggested to everyone that they take a short break from photography and simply appreciate that they’re probably witnessing the most beautiful thing happening on Earth at this moment (a feeling every nature photographer should experience from time to time). It’s always exciting to witness a moment like this, a breathtaking convergence of Earth and sky that may not occur again exactly like this in my lifetime. It’s even more rewarding when the event isn’t an accident, that I’m experiencing it because of my own effort, and that I get to share the fruit of my perspiration with others who appreciate the magic just as much as I do. Great post Gary!! And wonderful, wonderful photography! Thanks so much for sharing your insight and your work, but thanks again for making sure people hear that we should truly appreciate the beauty of what we are trying to capture. Have a great week. Nice post and stunning photo. That’s an absolutely stunning image, Gary. I enjoyed your post and agree that a little planning can truly lead you to finding a unique capture. It’s wonderful when all the planning and preparations come together to create a magical shot like you have of this crescent moon above Yosemite Valley. Where are you planning next? Thanks, Steve. I have workshops scheduled for Hawaii, September 12-16 and 19-23; the Eastern Sierra, September 29-October 3; and Yosemite October 27-30 and November 6-9. The November Yosemite workshop is timed to coincide with a full moon rising above Half Dome at sunset. Great post Gary. It speaks to the amount of effort required to get a “lucky” shot like that. Well done. As one of only 14 people in the universe to witness and photographed this along with you Gary, thanks for all of your hard work in getting us to the right places at the right time during your workshop. You made my first trip to Yosemite even more memorable. I will defiantly be back with you in the future! My pleasure, Kevin. It was really great having you in the group–your humor and positive attitude often made you the life of the party, even on the earliest mornings. When people hear how long our days are (“4:45? In the morning?”), they can’t understand how these workshops can be so much fun. Good photography doesn’t hurt, but it really is the people that make these trips work. Getting to know Yosemite for the first time with you as my guide will be an experience I will never forget. Your enthusiasm and love of nature is contagious. I feel so very lucky to have gotten to see such a special moment in time as the shot above indicates( Even if I did grumble when my alarm went off). I hope many more take advantage of your expertise and planning. Time well spent. Thanks again for the memories! the background was very interesting-thanks. i wish i were on that workshop. Really great post. Appreciate the honesty and enthusiasm in your writing.